SOUTHERN PINES, NC – The Bootleggers opened up their 2017/2018 season this past weekend at the Carolinas Kickoff Classic. The men dropped both of their matches, but showed a lot of heart having traveled light to the tournament. The club also took an inexperienced side to Southern Pines with a number of brand new players getting their first live match experience. The Kick Off Classic was a great opportunity for players to step up and make a claim for spots on the 1st XV with the Bootlegger’s first home match of the season coming up on September 23rd. Some of them did exactly that and selections for the New Bern match should prove to be difficult for the club coaching staff. While the Bootleggers came away with two losses, there were a lot of positives to take away from the weekend despite the two losses. 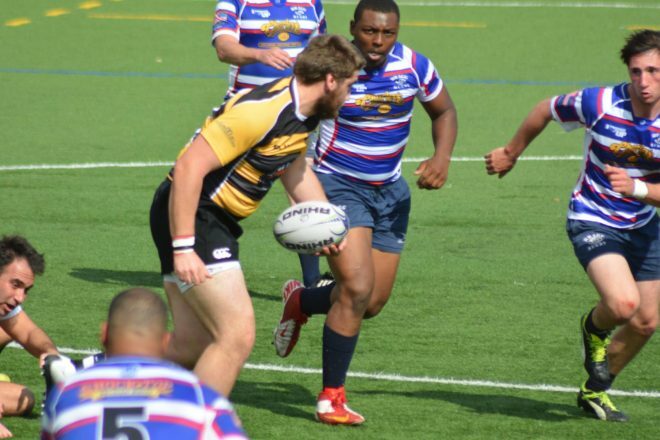 The Bootleggers opened up the tournament against the Charlotte Barbarians, a club that will be in the hunt for the Carolinas D3 title this season. After putting early pressure on the Barbarians, the Bootleggers got on top early with a score from Gareth Davies after a quick tap from a penalty inside the Barbarian’s 22. The Barbarians bounced back by capitalizing on Bootlegger mistakes with quick scores to take a 17-5 lead into the half. The bulk of the 2nd half possession belonged to the Bootleggers as they spent most of the half camped in the Barbarian’s half. The Bootleggers showed good patience and retention in attack, but couldn’t crack the Barbarian’s defensive line. The Bootleggers added a score from newcomer fullback Cam Grim on a well worked back line move. As in the first half, the Barbarians punished a couple Bootlegger mistakes to finish with two more converted tries and a 31-12 scoreline in favor of the Barbarians. In the second match, the Bootleggers were matched with familiar rivals Fort Bragg. Fort Bragg came out strong and dominated the early possession and territory. Showing a lot of improvement from last season, the Bootlegger defense held strong and kept shape as Bragg went through the phases with strong forward attack. The Bootleggers were first on the board as they capitalized on a few turnovers, from good work at the breakdown, and scored tries through Ted Chapman and two more from Cam Grim to take a 17-0 lead. Fort Bragg got one back before the half to cut the lead to 17-5. The Bootleggers lost scrumhalf Ted Chapman to a shoulder injury at the end of the 1st half and it took the steam out of their attack in the second half. The second half was all Bragg as they continued to wear down the Bootlegger defense with a punishing attach. Bragg took a 19-17 lead with about five minutes to play and then tacked on two more tries near the death to win 29-17. The Bootleggers have some work to do to prepare for their October 7th D3 Conference match against the much improved Fort Bragg squad. The Bootleggers return to action, with their first home match of the new season, on Saturday September 23rd with a friendly against the New Bern River Raiders. It is the club’s final pre-season match before opening up their Carolinas D3 Conference play at the beginning of October. Kick off is at 1pm at East Clayton Community Park. Admission to the match is free.